10 stages,1 prologue, 8 disciplines, 410km of iconic New Zealand wilderness and almost 300competitors with just seven days to complete Chapter 6 of GODZone. There willno doubt be plenty of blood, sweat and tears as New Zealand’s premiereadventure expedition race kicks off Saturday (tomorrow) at 7am NZST from themain beach in Queenstown Bay. multi-disciplinedcourse to competitors today just 24 hours before the race start. He says it willbe a showcase of the adventure capitals iconic locations. “The firstday is an 8 – 12 hour prologue showcasing the regions best starting with a trekup One Mile towards Ben Lomond with spectacular views, rocky outcrops and steepridgelines. A 2-hourkayak down the Shotover and Kawarau Rivers will finish with a spectaculargorgeering section up the Arrow River to Whitechapel and the first transitionarea. From here teams will head into Stage two and the first major trek overCoronet Creek, Bullendale and over to Branches Station in the famous SkippersCanyon. “There are plentyof vantage points along the way for locals and supporters to get out and followthe teams on their first day of racing. The adrenalin will be pumping,” saysWarren. Day two ofGODZone heralds the introduction of a new discipline to GODZone – white waterrafting on the Shotover River. “It’s superexciting for teams to white water raft through Skippers Canyon thanks to thesupport of Queenstown Rafting who have been operating on the Shotover Riversince 1974,” says Warren. From hereteams are on a 38km technical mountain bike through the Moonlight Track to MokeLake, then on to bike orienteering at 7 Mile Bike Park. It’s a route that picksout some of Queenstown’s favourite bike trails – such as Gold Digger – and willbe a lot of fun for the teams. The GZ Purecourse traverses a distance of approximately 410km with over 12,000m ofascent. The GZ Pursuit course is slightly shorter with approximately 10,000m ofascent. Bates says the Queenstown course is very challenging with a substantialamount of elevation gain over demanding terrain. 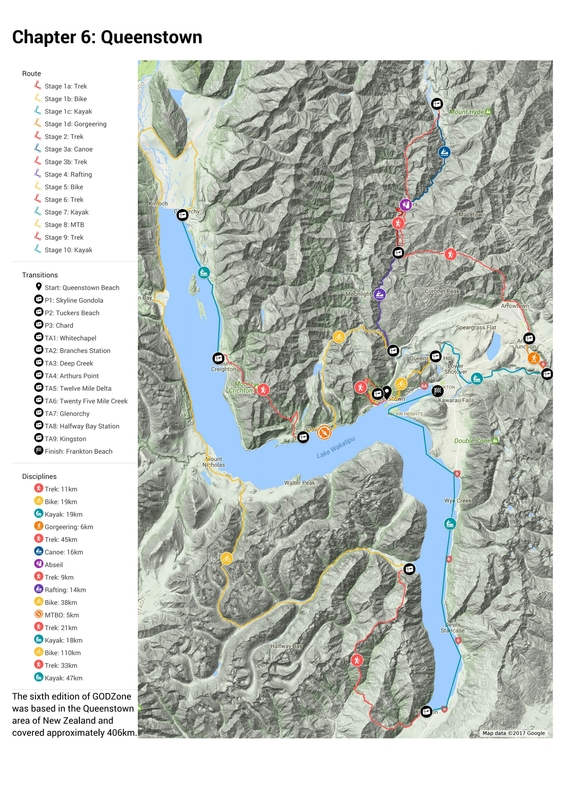 By daythree most of the lead teams will be heading up to Lake Isobel on Mt Crichtonand to the summit at 1970 meters before descending to Lake Wakatipu and theStage 7 kayak to Glenorchy. “ Someleading teams may get to this point by the end of day two but others not untilday three or four of the event. It’s where cut offs start to come into effectand we will see a split in the field for the GZ Pure category,” says Warren. The Lochyvalley south of Glenorchy sets the scene for the last 110km mountain bike overthe Afton Saddle and down to Halfway Bay on the Cecil Peak. “ This isNew Zealand back country riding at its best with the teams heading in to thethird and final 33km trek through the Eyre Mountains to Kingston,” says Bates. The finalstage of the massive expedition course is a near 50km kayak up Lake Wakatipu tothe finish line at Frankton Beach. Bates says he expects the first team’s homeas early as Tuesday evening. GODZoneis one of the most technically challenging expeditions in the world with teamsracing for up to seven days and navigating their way through 300 – 500km ofunknown terrain. Each team of four must stay within 100 meters of each other atall times as they kayak, mountain bike, trek, raft and climb across some of NewZealand’s most iconic landscapes.